A scenic creek that meanders through the center of the University of South Carolina Upstate’s campus is no longer anonymous. USC Upstate is pleased to announce the U.S. Board on Geographic Names has approved the university’s proposal to apply the new name Persimmon Creek to the previously unnamed stream. The agency said the name has been entered into the Geographic Names Information System (GNIS), which is the nation’s official geographic names repository, and is available and searchable online at geonames.usgs.gov. Turner explained the new name is inspired by the persimmon tree, a fruit-bearing species native to the region that grows along the banks of the 1.9-mile creek. 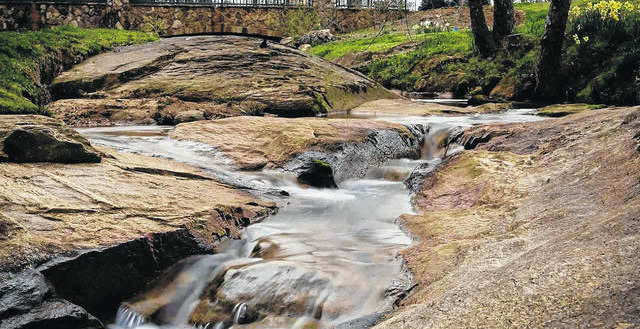 Turner was responsible for naming Butterfly Creek, a small spring-fed stream on the city of Spartanburg’s north side that has been featured as part of a major public-private endeavor to rejuvenate the surrounding community. He said his work with that naming project enabled him to become familiar with the process and served as part of his inspiration to do the same with USC Upstate’s campus creek. Persimmon Creek flows generally northeast from the Southern Shops community to its confluence with Lawson’s Fork Creek about 1.3 miles southeast of Valley Falls. Throughout the years, the creek has been referred to as Pollywood Creek, an unofficial name Turner suspects attached itself to the stream years ago when geographers or developers mapped out the property. Pollywood Creek has been recorded in GNIS as a variant name, according to the U.S. Board on Geographic Names. The creek is a focal point of the university’s Susan Jacobs Arboretum. Created in 2002, the 12-acre arboretum features a dozen gardens that span from Gramling Drive to Hodge Drive, a 300-seat amphitheater, lighted walkways, foliage indigenous to the area, and rows of Nuttall Oak trees that define its north quadrangle. Named for Susan Jacobs, a 1980 graduate of The Mary Black School of Nursing, the arboretum serves as the center for activity for future campus life and student programs. It provides a place for relaxation, enjoyment and reflection, and for cultural, social, and entertainment events.